The boomslang snake used to be thought harmless – until a very experienced herpetologist was bitten on the thumb while handling one. By the next day, he was dead of internal bleeding, caused by the venom of this ‘harmless’ snake. The boomslang doesn’t attack often – it’s pretty shy and will run away if it has the chance. Only people handling it or trying to capture or kill it will inspire its fear and cause it to bite. Then the venom begins its slow work of destroying the red blood cells and causing widespread hemorrhaging that eventually causes the person to bleed to death internally. It can take three to five days to actually cause death. Luckily, an antivenin is available, but it’s rare. Anyone bitten by a boomslang should immediately get to a hospital. More information at Reptiles Magazine. Ancient sharks – extinct, yes, but what if they did exist? Image credit: Reconstruction by Bashford Dean in 1909, via Wikimedia Commons. 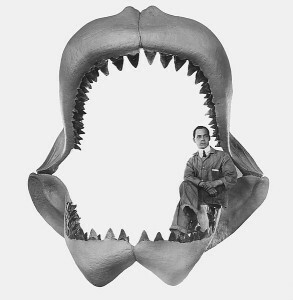 This article at IFLScience gives all the science that tells us the megalodon shark is gone. Dead. Extinct forever. Perhaps not in real life – but anything is possible in fiction. Scientists have been reasonably sure that what happens to the parents won’t affect the children’s genes. This because the genetic markers gained by the parents through their lifetime – whether it’s through a deliberate habit, like smoking, or a life event, like a famine – are erased by a cleansing principle called the Weismann barrier. However, scientists are starting to find that this isn’t entirely true. Up to 5% of the genetic markers are missed by the this genetic cleansing. They’re postulating that this is why Dutch children whose mothers had been pregnant during the post-war famine are often being diagnosed with schizophrenia. Diabetes, bipolar disorder, and obesity seem to be other effects that may be caused by this missed cleansing. Doesn’t it make you wonder what your parents might have done or been through that made you who you are today?